First, let me tell you about a new sport Kelly has adopted with all the enthusiasm of a child who just discovered ice cream. Spearfishing. When I was getting my open water scuba certification, I went through a shop that also specialized in spearfishing. And after Kelly spent two consecutive afternoons of watching spear fishing videos while waiting for me (and already having a love of fishing in general), I knew that a new pastime was hatched. Spearfishing is quite an interesting sport, and a natural draw for anybody who likes fishing as well as snorkelling. It involves diving under the water with mask and fins, and basically hunting for fish with a spear. A basic spear itself is quite primitive, with three prongs with which to spear the fish, and a thick rubber band at the other end to enable the hunter to “shoot” the spear a very short distance. (If you’ve ever shot an elastic band at anybody by stretching it over your thumbs, you’re already half way there). Over the next few weeks, we caught and ate a number of interesting fish. Some of the tastiest and more adventurous were octopus, triggerfish, and parrotfish. But it was when Kelly came home one day with two large triggerfish and a 3-foot moray eel that he had taken spear fishing to a new level. All the while, one of our roommates (who is a snorkel guide) had been warning us of eating reef fish, due to some disease you can get that makes you crazy. We decided to ignore her, attributing it to her own craziness and lack of desire to eat seafood. We also took comfort in the number of local Hawaiians who fished in the same area as we did and looked pretty sane to us. After eating our moray eel though, something changed. The next morning, we were decidedly feeling ill. I won’t get into the details, but let’s just say that “gastrointestinal effects” is a valid symptom. Ah – no worries. Sometimes it happens, we said to ourselves. Bad eel. 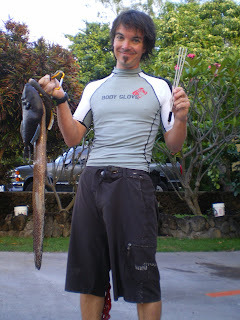 (We had indeed confirmed that moray eel is edible, and in fact historically was considered to be food reserved for Hawaiian royalty, probably because it’s so bloody hard to skin). But it was when we poured ourselves a glass of cold water, and it felt burning hot to the taste, that we thought we should examine our symptoms more closely. Ciguatera is a form of toxic poisoning contracted by eating reef fish that feed on a certain form of bad algae. A more concentrated dose can also be consumed by eating fish that eat these reef fish – like barracuda, grouper, parrotfish, and…moray eel. Symptoms include “gastronomic effects” (we’ll leave it at that), and “neurological effects” which include headaches, numbness, paresthesia, muscle ache, and even hallucinations. One of the additional classic symptoms is a reversal of hot/cold sensation, technically referred to as cold allodynia. Symptoms can be exacerbated by ingesting caffeine, nuts, alcohol, and exercising. So that spiked coffee and peanut-butter sandwich after our run probably wasn’t a good idea. Check. We seemed to have many of the minor symptoms (not mentioned here), as well as many of the major ones. Although we were not hallucinating. Well, I guess you never know – do ya? Maybe those pink bunnies weren’t sailing away the other day at sunset. Hmm. So quietly and privately (for fear of our roommate finding out and saying “I told you so”), we researched what seemed to be our first tropical disease. It appears that we caught a small dose of it, since our symptoms aren’t as extreme as they can be. There isn’t any treatment for it, and in fact it is frequently mis-diagnosed as MS or chronic fatigue. It’s also fairly rare as diseases go, with about 50,000 reported cases each year. The good news is that it is not fatal, and we are sure that ours is a mild case at best. The symptoms subside within days to months, but we are always to be on guard as relapses do occur, and subsequent ingestion of toxic fish can compound the effects. So sadly, as quickly as it started, Kelly’s spearfishing career has come to a tragic end. In fact, I categorically refuse to eat just about anything that he catches, with a spear or fishing rod now. Dammit. And I like seafood, especially the free kind. And damn our room mate for being right. But please – don’t tell her, okay? Thanks, Nora. I’m sure I speak for all the lurkers here in saying that you are my all-time favorite source of vicarious nomadic thrills. Love the subtle punnery of “gastronomic” adventures causing “gastrologic” issues. Wow – Thanks for the compliment! And I have lurkers! Awesome…. Thank, you. Thank you very much. I’m actually quite proud!